The first cemetery serving Farmington was the Presbyterian Cemetery located 1½ miles Northwest of town on what is now the Ardell Hanson farm. Some 24 burials were conducted there until it became land locked. Corinthian Cemetery was established in 1872 and occupied 5 acres of land purchased from N. Ezra Slack for $225. 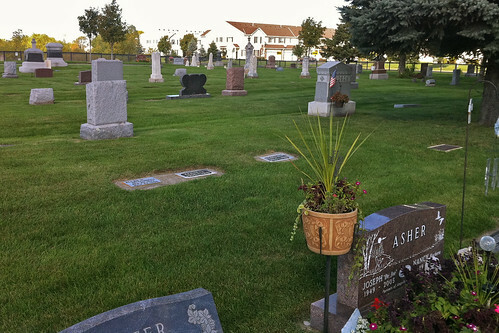 There had been several burials made on this 5 acres before formal establishment. 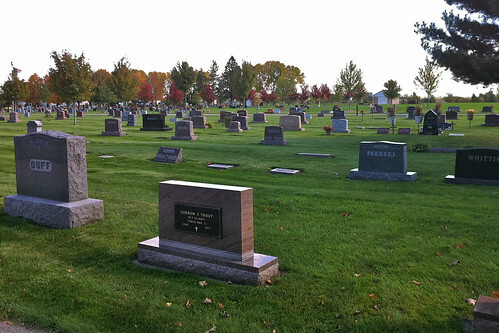 The Cemetery has now purchased an additional 10.17 acres South and Southeast of the original 5 acres. Corinthian Cemetery was formally established in 1872, although there are burials dating to 1867. Veterans from the Civil War to the current conflicts are buried in Corinthian Cemetery. The Civil War was fought from April of 1861 through April of 1865, only four years and close to 600,000 lives were lost. 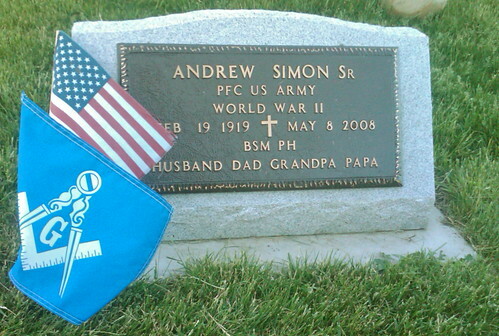 A long time resident of Farmington, Minnesota was one who fought in the Civil War. 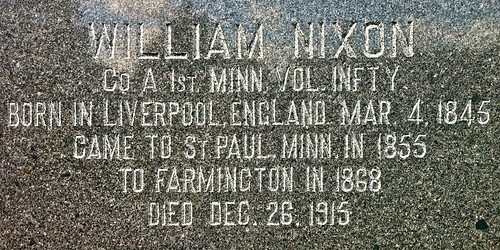 Billy Nixon came to Farmington after the war in the year 1868. He served the community as a harness maker, a mortician, and was kind of a “Johnny Appleseed” having planted many trees throughout this area. 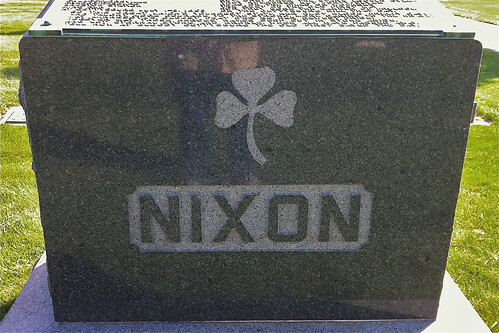 As you enter the center gate of Corinthian Cemetery looking to the East, just to the left you will see a monument that says NIXON. Enlisted April 23, 1861 in Co. A 1st Minn. Voluntary Infantry. 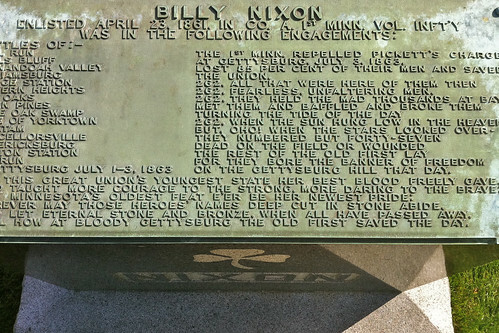 The 1st Minn. repelled Pickett’s charge at Gettysburg, July 3, 1863, lost 85 per cent of their men and saved the Union. met them and baffled and broke them turning the tide of the day. but, Oho! when the stars looked over- they numbered but forty-seven. for they bore the banner of freedom, on Gettysburg hill that day. and thought more courage to the strong, more daring to the brave. tell how at Bloody Gettysburg, The Old First saved the day.